An Ode to Bread . . . I'm not quite sure how to write an ode, but I will tell you, bread is special to me. I grew up smelling bread dough rise for my mom's famous cinnamon rolls. There was beer bread, warm from the oven and slathered in butter. Bread was always a part of our lives. My Bread Story: Well, I was dating this guy. And one day (15 years ago today, to be exact, right about this time of day...it's 4:30pm here), he called and asked if I wanted to go to Happy Hour. Of course, I said! He picked me up, and drove not to a restaurant, or to a bar, but to a park. A beautiful park. From the back seat, he produced a loaf of bread and a bottle of champagne. We sat on a wooden park bench, sipped champange and tore off chunks of bread. And then, I SCREAMED! There was something big and BLACK in the bread. He was calm, removed the black "thing" from the bread...it was a box. He knelt down on one knee and proposed. So, the rest is history. It may explain why, as I watched this Panera "Ode to Bread" video, I got teary-eyed. Watch it and tell me, does it make you teary, too? Just ONE of the reasons I LOVE Panera, is that their freshly made, always delicious loaves of bread are ready and waiting for me in the store when I don't have the time....or am feeling too lazy....to make my own. I'd love to for you to share it here...or with Panera on their Facebook page. I have NOT one bread story better than that one. I just eat bread a lot. And I am a gazillion miles away from Panera and have never eaten there. Poor sad little girl! NOTE - do NOT watch Ode to Bread if you are fasting. I have been to Panera once. I don't think that I had bread. Huh. No Panera anywhere close to me, which is probably a good thing. so stinkin' cute! I don't have a good bread story, but I sure did enjoy reading yours! Happy 15th Anniversary to you and Mr. E Bridget and blessings for many, many more happy years together. Cute story! Where did you get those plates? I LOVE them! I NEED them! Oh, you had me hooked when he didn't take you to a bar! RomanTIC! I don't have a bread story, except that i love it way too much, and have to limit my time making it, because it's really hard to have just one slice of home made bread. Your bread story is so sweet! I loved Panera's Ode to Bread, it does bring a tear to your eye! It also brought me wonderful memories of three hungry kids waiting for Mom's ok to demolish a loaf of her wonderful, warm, Italian bread. Hers is still the best yet. I've been blessed with her recipe, typed on a 3x5 index card by Mom almost 50 years ago. I can't say that I've ever heard a bread story, so yours is by far the best. But it would be even if I'd heard lots of bread stories, honestly! That is so sweet! I do love Panera and try hard not to visit there often for fear of shrinking my wallet and increasing my waistline. I thought the therapist on the video was a bit odd..slippers? Really? Odd. I do have a bread story, but has nothing to do with dates and romance. It has to do with winning a prize (actually, a bread machine)and starting to blog about food. It's the first post of my blog! What a great story....this would pretty much guarentee a YES from this girl...nothing like a fresh loaf of bread from the oven! So Sweet. how cute! that is such a sweet proposal story :) I've been to Panera twice this week, once for dinner with the hubs and the second time to study. We've currently got their sourdough bread in our fridge, but have you tried their everything bagels? One word ..perfection. Aw, bread is both yummy and nostaglic for you! 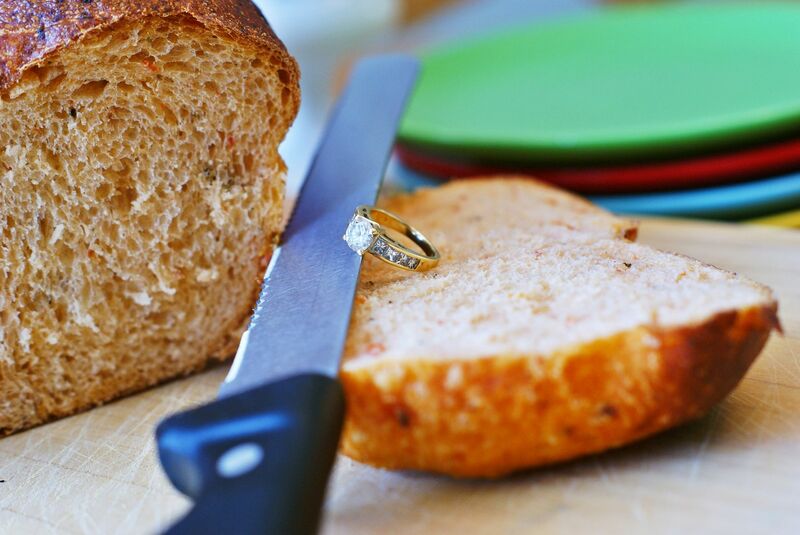 How amazing that he proposed via bread.. I do love Panera... Miss it since I moved to Canada. What a cute proposal story! PLEASE tell me that you made that bread and we can expect a recipe soon! :) It looks PERFECT and is making me crave those yummy carbs that I'm in currently shunning! That's so sweet! Anytime you find a guy who would go to those lengths you got yourself a keeper! Happy 15th Anniversary! I wish that I had a funny bread story to share, but I don't. We both LOVE bread, and it has to be at the table at most meals, that's all I got for you! Only story that I have to tell would be about the bread that I baked yesterday for my Blog;s First Anniversary. I wanted something warm and comforting to celebrate the comfort that my blog gave me all through out the year. 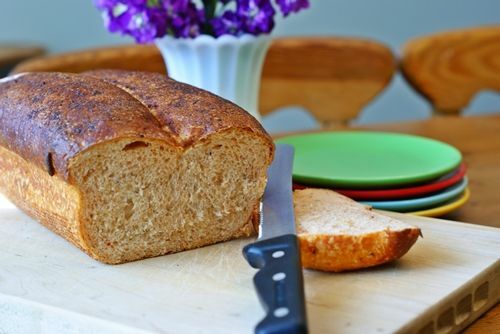 Nothing fit the bill more than a simple loaf of humble bread. I love it! That is a great story. Just wait until kiddo has to pull off something similar...Mr. E has set the bar pretty high. I too grew up with bread baking and making. This was the first year I ever attempted yeast bread on my own and I felt like a kid in my mom's kitchen again. That is one of the most adorable engagement/bread stories I have ever heard!! Another thing, I don't eat them often but eating a Panera bread bowl filled with hot soup is one of my favorite guilty pleasures. Every time I bake bread...it's a bread story.....yours is a dream-bread-story!!! Why does it never occur to me to buy loaves of bread from panera?! HA! And I think that is my favorite bread from there. The Mediterranean veggie sandwich comes on that I think. So soft and chewy and delicious. Mmm. I don't have my own bread story, except for the fact that I love homemade bread and have fond memories of a grandma that made it all the time, BUT -- I love your story!!!!! And -- your ring is pretty! Thanks for sharing! I just did a cookie feature on my blog, and your blog is one that I featured. Adorable story! Thanks for sharing! My only bread story is that for my daughter's graduation, I had everyone over for a party afterward and had baked homemade loaves of bread and made sandwiches on tons of homemade bread along with other homemade goodies. That bread looks great! And such a sweet story! I will have to watch soon. Good bread on the counter is like dessert to me! everytime I walk by I take a bite! I love your engagement story! That breads looks pretty yummy too! Even if I had a bread story, which I don't, it wouldn't be as sweet as yours. Happy anniversary of your engagement day! That's such a cute story... I definitely don't have a story that is even close to as fun as yours is! What a great bread story(although I can't really recall another bread story right now). How cute is that?! I love Panera's bread and I love that you have a special meaning with something that is otherwise normal to everyone else. It's the little things like smiling at a loaf of bread that make your days awesome. How is it that you've NEVER told me that story!!! How sweet!! I can't top that bread story!! but I love that shot of your ring! That is so sweet Bridget!!! What a wonderful way to propose!! i would scream too if there was a black 'thing' in my bread . . . but have to say that he's a clever one, that mister of yours! i don't have a bread story . . . at least one that i can share here . . . but i do have an engagement story that involves Mickey & Minnie Mouse . . .
That is the cutest story ever! We are bread lovers, but no good stories like this one!! Super cute!! i just LOVE bread. my sister started making homemade bread a while back and shared the simple recipe with me and i just love it. great blog! i'm your newest follower! I clicked your link but... no Ode to Bread video. Did they take it down? What a great bread story that was. Who thinks of such a thing? Mr. E. is one creative guy! No wonder you loaf him so much! That is one of the sweetest proposals I have ever heard!!! So romantic! I found a little black box with a diamond engagement ring in the middle of a heart shaped cake on Valentine's Day. Yes, I love bread, but a heart shaped cake will bring a tear to my eye. I adore your blog, I'm following! My bread story is kinda sad. I eat so much bread, I have rolls around my mid-section. Too bad beer bread doesn't give you a six pack! I like your story so much better! You have a real keeper there. I wish we could all find "the one" that would do something as romantic one day. After viewing that video, I realize that your husband chose the PERFECT way to propose to you:) What a great story.